Welcome to my brushes with greatness page. For those of you who are intelligence impaired, this page is about the famous people I have met, or almost met, throughout my life, which adds up to a very short list. Ok, Sheryl Crow is my favorite musician. Technically, I have not met her yet, but I have seen her like 4-5 times in concert and I got one of her guitar picks when she threw it off stage, and we made eye contact once even though I think she was making a face at me...but...so... I will just call that a brush until I can actually meet her. I had the greatest time of my life at her concert at the Grand Old Opry in Nashville. Not only did our 4th row seats turn out to be second row (because they had the chairs set up around the stage differently than on the arena map), but I got to meet many other famous people that I will tell you about in a second. I have some pictures from her concert in Memphis see them here. Deana Carter is one of my favorite musicians as well, so you can imagine my excitement when I heard someone at the Sheryl Crow concert whisper behind me, "Isn't that, that country singer..oh...whats her name..Carter...". I jumped up and got on the lookout. 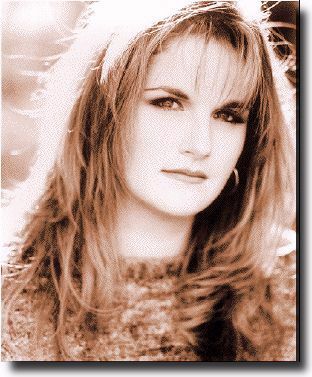 I saw her, she was sitting in the middle of a row right next to Trisha Yearwood. I was not sure of what to do, should I go over and say hi and try to get an autograph or should I just leave her alone? I was scared, but adrenalin took over and soon I was running out the back door and down the isle next to her seat. I pushed through the row in front of her and sat in the seat directly in front of her. Now what? "Uhm... Miss Carter? Can I have your autograph?" I said quietly. "Sure!" she said. She was very friendly, even though I was a dork, and she gave me an autograph on this little piece of popcorn box that I found on the floor (WHAT? I didn't have any paper with me...SEE SCAN BELOW). WOW! 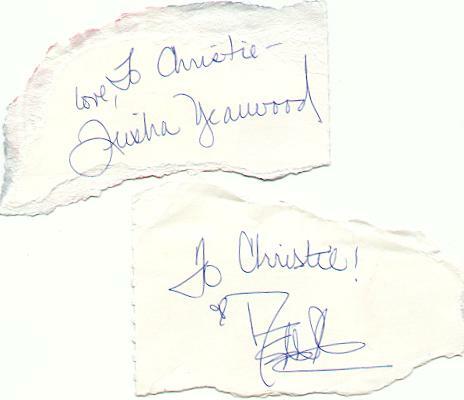 I was such a dork, but she just smiled and gave me an autograph anyway! After the show, she and her brother were still sitting in the row, and the whole place was almost cleared out, so I went over and asked her if she would take a picture with us and she said "SURE!". I am sure that we pestered her to death but she was so nice to us! Thanks Deana for being so nice! OK, at that time I really didn't know much about Martina McBride, I just knew that she was standing right in front of me when I barged down the isle to get Deana's and Trisha's autograph. I almost had to say "excuse me", you know, to get by. I walked right by her on my way down, I thought about asking her, but Deana and Trisha were more important. Sorry Martina, I am sure you are really nice, but I had to get to Deana and Trisha, you understand, right? She looks mad doesn't she? 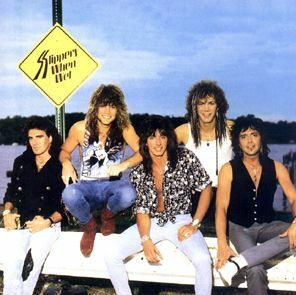 I have always been a big Bon Jovi fan ever since I was in camp and we lip-sync'd to Wanted Dead or Alive and won a camp contest. Alec John Such was the bassist for Bon Jovi throughout most of their career. He is the one sitting on the rail, far right, with the patent leather (or whatever they are) white boots on. Just recently, for reasons I don't know, he quit, or they fired him or something, but when I met him he was still in the band. He was giving a bass clinic in a town near mine, so I went. I got a NEW JERSY bass pick and he autographed my "Keep the Faith" CD (Ill scan it later for you). He was really nice, I wonder what he is doing now?